Here Today AND Tomorrow: Part VII - Social Entrepreneurs, Inc. If you have been following along in this sustainability planning series, then you know that funding is only one piece of the sustainability puzzle. We intentionally left the discussion of funding—or as we refer to it in sustainability planning, strategic financing—until after we addressed other key elements of sustainability. At SEI, we believe that the most important thing to note about approaching the financing of an organization is that it needs to be done from a strategic mindset. It is not just about finding the money; rather, it is an intentional process that considers how funding opportunities fit and align with the organization’s mission and desired results. It should be thought about, planned, implemented, and continually monitored. Also, it should be something that is not looked at through a “fixed” mindset but rather considers, and then selects from, all of the options and opportunities available to ensure the positioning and adaptability for fiscal sustainability. What financial resources do you need to cover expected costs now and in the future? The answer to this question lies in your current budget and your projected financial needs in the coming years, based on your strategies. Are you overly dependent on a single revenue stream? If so, you must understand your funding model. How much do you need to generate from each revenue stream to support your goals? Who in your organization will be involved in planning for and managing the organization’s finances? This question should take you back to your internal systems and capacity. Do you have internal staff with an expertise in funding source types, or an external resource on which you can rely? Do you have internal systems such as a donor management database to manage and track funds? Who will be in charge of donor management, grant writing, special events, getting major gifts, accessing fundraising circles, and online fundraising? What does the funding landscape look like? Understanding how donors are behaving and giving and where foundations are focusing efforts is important to develop and adjust your financing strategies. Giving USA and Blackbaud Institute release annual reports on philanthropy in the United States every year, and The Philanthropy Outlook helps fundraising professionals understand what changes may be coming down the line. Having a strategic financing orientation means you know what to sustain and how to sustain it. It means you have identified exactly what resources are needed and have developed strategies to acquire those resources. 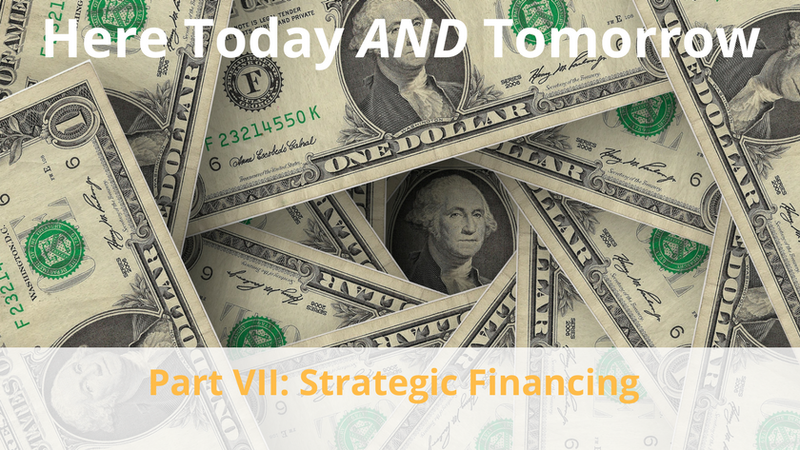 Ultimately, a strategic financing orientation requires a long-term perspective and a plan to cultivate multiple diverse sources of revenue to maintain financing at sufficient levels. We recognize that assembling the pieces outlined in the short list of strategic financing components above may seem like a huge undertaking depending on your organization’s state of development. However, when a strategic financing orientation is in place, an organization can focus its efforts on the work needed to achieve results, instead of being distracted by the need for financial survival. The organization is then poised to take advantage of funding opportunities in its environment; and, can easily identify whether a funding opportunity is a “fit” or not. Ultimately, it is this orientation that will support your long-term sustainability. Next week, we come to the eighth and final post in this blog series, Creating the Sustainability Plan. Mark your calendar now for our FREE LIVE Q&A Session with Sarah Boxx, SEI Principal, and long-time capacity builder, scheduled for April 19, 2018. Details soon!